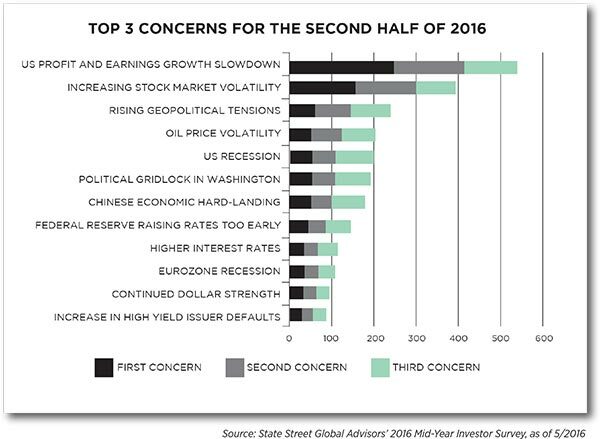 The first half of 2016 has been perplexing—and perhaps a little frightening—for many investors. Many of the themes that seemed poised to influence market action at the start of the year have been turned on their heads, along with the market forecasts offered by many investment strategists we follow. As we headed into 2016, we expected 2015’s “low and slow” growth environment to carry over and market risks to be skewed to the downside. At WT Wealth Management, we are always optimistic but cautious. As I repeatedly tell clients, we constantly identify areas of risk and analyze whether the risk is worth the reward. Repeatedly, limiting drawdowns is a proven way to build wealth over time. In our initial 2016 outlook, we included a warning that fragile global markets could turn volatile on a single bad data point or negative news event, such as slowing GDP in China, a debt flare-up in the Eurozone, or an unexpected rapid rise in interest rates in the United States. Remember, in late 2015 the Fed was pounding the table that we could see four rate increases in 2016. Plus, Brexit wasn’t even on our radar as we entered 2016. January trading got off to a very difficult start: the S&P 500 index started off 2016 with a historic slide, in fact, it was its worse opening to a year in its history. The S&P 500 started 2016 with a 1.53% decline on Monday January 4th and by Friday, January 8th it had lost 5.96%, by January 20, it was down 9%. Between January 1 and February 11, the worldwide sell-off eventually resulted in a 9% decline in the MSCI World Index, a 10.5% drop in the S&P 500, a 14.79% decrease in the NASDAQ, and a staggering 21% plunge in Japan’s Nikkei. Front-and-center in the turmoil was a series of conflicting messages from China’s policy makers—and each iteration seemed to unsettle the market more than the previous one had. This volatility surge resulted in rallies in assets such as gold and US Treasury notes as the 10-year Treasury note plunged from 2.25% to 1.65% between January 1 and February 11. This aggressive decline at the start of 2016 also contributed to market volatility in the energy sector and US high-yield bonds. That conveyed a message of weak underlying global demand, along with global recession fears. But by the second week of February, everything changed, as it often does, and growth assets began a strong rally. The S&P 500 clawed back into positive territory for the year by mid-March. A compelling catalyst for the rally was a reversal in crude oil prices, which had fallen 29% by mid-February. Rhetoric and rumors from oilexporting states on possible production freezes or cuts alongside lower expected capital spending provided the base for an 84% rally in oil from February 11 through June 23—quite the reversal. If the market movements thus far weren’t enough for investors to feel a bit woozy by the end of June, then the surprising Brexit result should have sufficed as the final body blow. 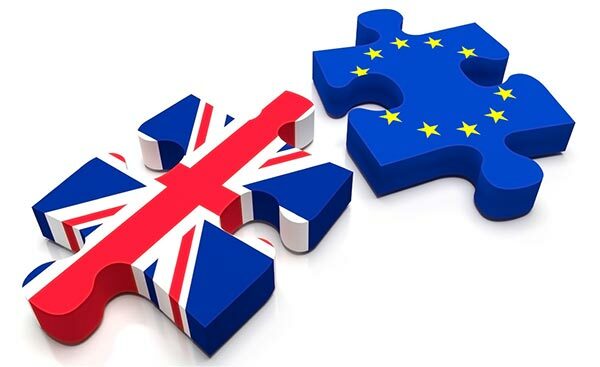 Though a close vote was anticipated, given polling results leading up to the vote, market participants were ill-prepared, to say the least, for the United Kingdom (UK) to vote to leave the European Union (EU). Equity markets roiled on June 24 as investors reacted to the outcome. Financials broadly came under pressure, especially those located in the UK and Europe. However, the markets began to bounce back during the last few days of June, and global markets staged a startling recovery: both the Dow Jones Industrial Average and the S&P 500 reached new all-time highs. Not surprisingly, the pound and the euro retreated with the Brexit vote—the pound fell to a level unseen since 1985—while the US dollar and the yen strengthened as global investors sought out more stable currencies. The rebound in commodity prices is still holding ground as it takes the Bloomberg Commodity Index to a yearto- date gain of 13%, led by a 30% gain in crude oil. Perceived safe-haven assets have been among the best performers: Long US Treasuries, gold, and the Japanese yen finished the first half of 2016 at their highs for the year—up 15%, 24%, and 14% respectively—confirming the abundance of caution in the markets. 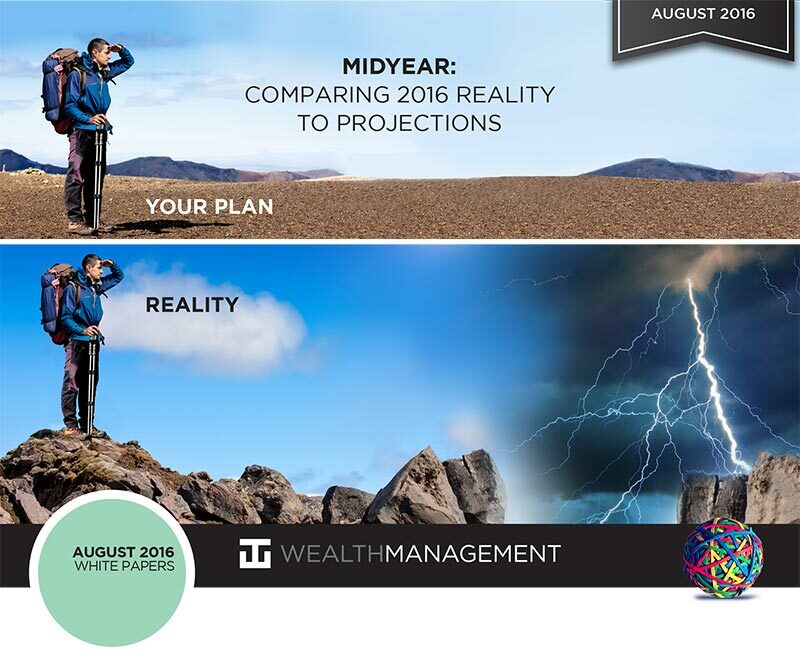 2016 Projection: Over the course of 2016, risk assets (mostly equities) will be positive. Our 2016 forecast for S&P 500 was a 6-8% return; as of August 9, we are ahead 6.95%. The initial sell-off in risk assets at the start of 2016 prompted a flight to safety and policy support by global central banks that buoyed global bonds, relative to equities, in the first half of the year. As mentioned above, global equities then rallied on the back of stronger oil. Brexit-related selling then seemed to extinguish these gains, but a dramatic rebound during the last week of June, post-Brexit, brought many equity indices to positive ground. Looking forward, it is difficult to see through the fog of flux that persistent volatility can be a headwind for global equities. 2016 Projection: Japanese and European equities will likely be among the best performers. Our positive view on Japanese and European equities was supported by a belief that continued policy support in expansionary monetary policies would further weaken the yen and the euro. We believed that this would improve relative global competitiveness and support nascent local economic recoveries, which would translate into stronger corporate profits. As predicted, policy support was extended with a move to negative interest rates in Japan on January 28 and deeper negative rates in the Eurozone in March, along with an expanded bond-buying program. The market reaction, however, has been somewhat counterintuitive. The Japanese yen and the euro both strengthened relative to the US dollar, while Japanese and European equities broadly underperformed the MSCI World Index. Prior to the UK referendum, we downgraded our assessment of the Japanese and European equities, due to the apparent limits to policy support in a negative rate environment. Since the Brexit vote, we have been wary of European and Japanese equities, so we have added UK stocks to that list. In most portfolios we are neutral-weighted in international developed market. 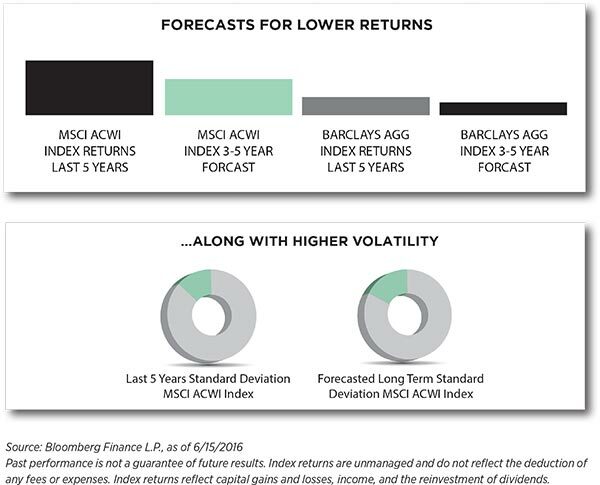 2016 Projection: Volatility will remain highly unpredictable. This market forecast has certainly proven correct. Given the continued list of uncertainties confronting markets, we expect the tenuous environment to persist through the end of the year. Though China fell out of the headlines at the end of the first quarter, the challenges it faces to support a slowing economy while maintaining a strong currency stance remain, and will likely test market nerves again before too long. The recent 6.5% GDP report of China was received with skepticism and mixed emotions, to say the least. US GDP (Gross Domestic Product), our best measure of the health and strength of the U.S. economy, has been sluggishly slow in the first two quarters of 2016. In the most recent adjustment to Q1 GDP the U.S. economy grew at a worrisome .8% and the first look at Q2 GDP was reported at 1.2%. There will be two more revisions to Q2 GDP but most experts do not anticipate a major upward revision. Looking back to Q4’s 2015 GDP number of .9% and the U.S. has had 3 extremely lackluster quarters of economic growth. In our opinion, this has put the Fed in the difficult position of wanting to “normalize interest rates” while not derailing economic growth and sending us back into recession. To put this into perspective from 1947 to 2016 the GDP growth rate in the United States has been 3.22%. Simultaneously, fallout from Brexit will likely keep European markets on edge. Global economic growth is expected to further moderate in 2016 relative to 2015, accompanied by a persistent decline in developed market productivity that will restrain potential earnings growth. 2016 Projection: Commodity-exposed and interest rate-exposed sectors are positioned to underperform. This theme did not play out in the first half of 2016, given the sharp rally in oil and flight to government bonds and other dividend-paying securities such as preferred stock, REITs, utilities, and high-dividend securities. Looking to the second half of the year, however, the sharp rise in commodities and bond prices may be difficult to sustain. So we would rather own REITs, municipal bonds and preferred securities than government or corporate bonds. While the Brexit vote has near-term market implications, its longer-term uncertainty is perhaps most unsettling. Will this lead to further nationalistic leanings in other EU countries? What will be the economic consequences of this new dynamic? Is the Federal Reserve on hold now, or will we perhaps see a coordinated policy response? These and many other questions will likely weigh on investors’ minds in the coming months and cause uncertainty at a fragile time in the economic cycle. One thing is for sure: generating accurate market forecasts will not become any easier. Since market volatility is a top worry for financial professionals, we suggest that investors work with us to revisit their personal risk tolerance so we can identify your tolerance for drawdowns, as well as any liquidity events you may have in the coming months. In a low-return environment, marked by heightened volatility, we will generally hold more cash, in addition to high-quality, low-beta dividend-paying securities and employee-stringent risk management techniques such as not owning more than 6-7% in any single individual equity. This is not the time to be greedy. A gain is never realized until the sale takes place. To potentially mitigate downside risk, managers should seek out a strategic allocation to REITs, preferred stock, utilities, and low-volatility equities. Adding a strategic allocation to REITs within a diversified portfolio can offer a number of potential benefits, including acting as a potential hedge against stock market volatility, and potentially improving diversification, given such a strategic allocation’s low correlation with traditional asset classes and other commodities. The notion of “lower interest rates for longer” seems to be written in pen rather than pencil these days. This resulted from the uber-accommodative monetary policies from the European Central Bank and the Bank of Japan, combined with a now more dovish Bank of England, due to the Brexit aftershock and the fed funds futures, which show an implied probability of no rate hikes for all of 2016 and only a 37% probability by September of 2017. Concurrently, we believe the Barclays U.S. 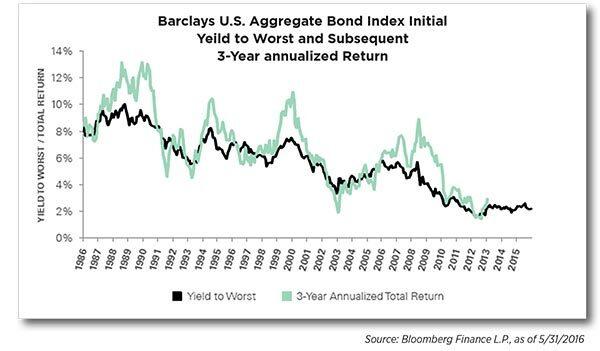 Aggregate Bond Index (AGG), which tracks the performance of the US investment-grade bond market, and similar traditional exposures offer an unattractive payoff: duration has increased by nearly 50%, while the yield has declined by 50%. This leaves many managers who use these tools to access fixed income with exposure more toward the downside (duration/risk)—than upside (returns/yield). We have thus dramatically reduced our exposure to this asset class in the last 30 days. The chart below illustrates the returns major asset classes have shown so far this year. As you can see, their ability to provide returns remains quite challenging. In a low-return world with higher-than-normal volatility, a strong foundation is not a luxury—it is a requirement. This may involve looking for better core positions that seek to provide broad-market exposure with active and smart-beta approaches. In fact, we have de-risked many portfolios in the last 30 days with “smart beta” ETFs that seek out high-dividend, low-volatility equities domiciled in the U.S.
With a diversified and well-balanced core, we can then take a more tactical approach with sector, industry and thematic investing to potentially harness growth or business cycle trends, or to seek out value opportunities from perceived mispriced areas of the market. This may mean exploring market sectors poised to benefit from consumer and housing market resiliency, or considering an inexpensive area of the market, such as energy and financials. As we pass this year’s mid-point, this is an excellent time to contact us and schedule a call to review both your portfolio and developments in your life so we can help you to manage the risk in your portfolio. Portfolios at WT Wealth Management are like DNA: virtually no two are alike. This is what makes us different. We realize there is only one you—and you are special.